I couldn't let the month of July go by without posting something to commemorate the moon landing forty years ago. However, instead of the usual lunar images and space-suited astronauts I thought I'd share instead this uncirculated 1969 souvenir postcard from the John F. Kennedy Space Center of the crew of Apollo 11 in their civilian clothing. 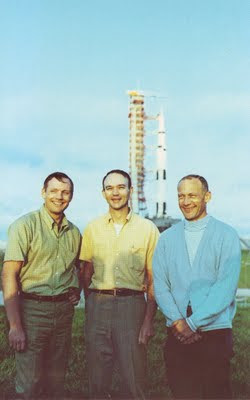 Neil Armstrong, Michael Collins and Buzz Aldrin are pictured smiling in front of the launch pad and the Saturn V space rocket that would take them into space. This chrome printed postcard was produced by NASA Tours (conducted by TWA), is numbered 114498 and is in pristine condition. It was love at first sight for me and this superb hand-tinted real photograph postcard issued by P-C of Paris, France (active during the 1920s). As was common in this period the colours are far from realistic and instead are used for expressive purposes with the lovers depicted in what was then a popular shade of blue. The white detailing on the woman's dress has been applied with thicker paint so that the surface is slightly raised. The card is uncirculated and has a divided postcard back, which is entirely covered with a romantic message in French written in very neat handwriting, dated 10 September, 1924.